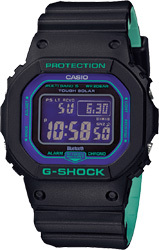 From G-SHOCK, the watch brand that is constantly setting new standards for unmatched timekeeping toughness, come new 90's retro sports themed models. 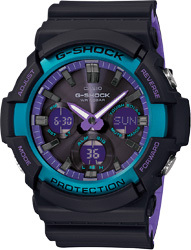 The basic black coloring of these models is updated with neon-like purple highlights on the bezel and face for a low-tech look. 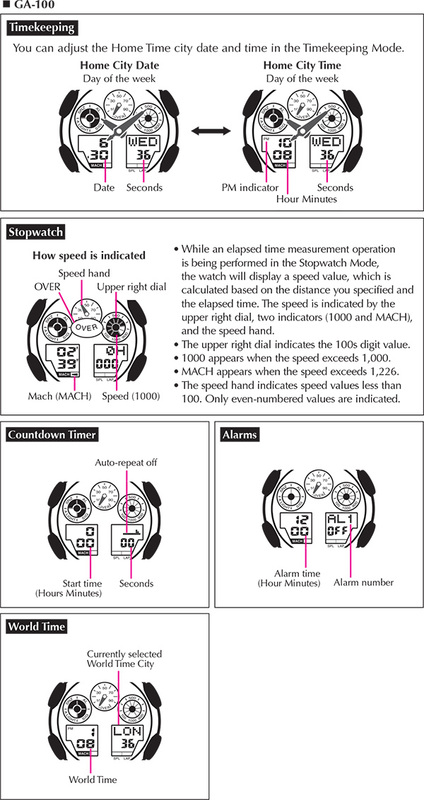 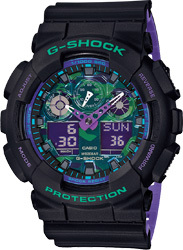 The base models of this lineup are the GW-B5600, which inherits the form of the original G-SHOCK, the GAS-100 that combines a big rugged case with an aluminum bezel for a look of casual elegance, the mid-size three-hand GA-800, and the GA-100 with four digital display areas and big, lightweight, highlydurable aluminum hands. 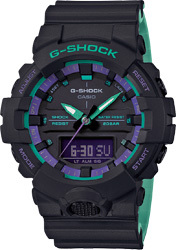 Bi-color molded bands are black on the outside and green (GW-B5600BL, GA-800BL) or purple (GAS-100BL, GA-100BL) on the inside.